"Our eco friendly household cleaning products are as effective as the leading supermarket brands, and our body and baby care ranges are gentle on your skin and are simply beautiful to use. Our hand and body washes are made from naturally derived ingredients that gently cleanse, condition and nourish your skin. All of our products are made from plant- and mineral-based ingredients, free of toxic chemicals, that bring people closer to nature with non-toxic, environmentally safe solutions that also help to reduce our carbon footprint." 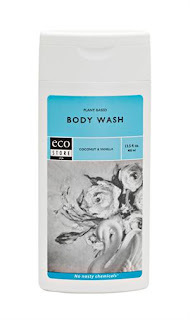 I was thrilled to have the chance to review the All Purpose Cleaner and the Coconut & Vanilla Body Wash from ecoSTORE USA. Ecomommas can go room to room with this product. Simple to use yet high performance, ecoSTORE All Purpose Cleaner is the ideal alternative to conventional, toxic products. 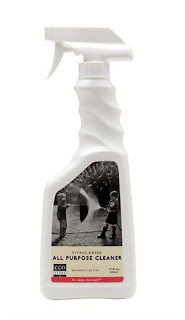 This citrus based spray will work wonders on almost any household surface. Have black kitchen appliances? We've been told via many testimonials that it is just awesome. And, of course, if it’s an Ecostore product, it contains No nasty chemicals™. For your health, for your family and for the planet. I really love the All Purpose Cleaner. It cleans as well as the leading store brands, and it has a really clean citrus smell, too! I have black appliances, and I love how this cleaner doesn't leave streaks! A little goes a long way, so this product lasts quite a while. I use it daily and I still have well over 3/4 of the bottle left. Enjoy top-to-toe luxury with our new coconut & vanilla body wash. The blend of certified organic essential oils adds a fresh summer fragrance to the naturally derived ingredients and moisturizers. Unlike many leading brands, ecostore USA body care products do not contain Sodium Lauryl Sulphate, artificial dyes, perfumes or preservatives which means they are extremely kind to sensitive skin. I am also very pleased with the Coconut & Vanilla Body Wash. It smells great, and leaves you feeling clean! I definitely plan to try some of the other scents in the future! Overall, I am very impressed by the products offered at ecoSTORE USA. I love all of the chemical free options that they offer. From baby care to household cleaning, they've got you covered! BUY IT! You can purchase your own eco-friendly items at ecoSTORE USA. Be sure to visit today - they have an exciting fall promotion going on with up to 30% off of most items!